Today to celebrate my 50th year we drove to Provo and ate at Osaka on Center Street. We use to live less than a mile away but what this place reminds me of most is when I did Christmas windows out of candy for Provo City Arts Council. I did my window in Osaka all but the very first year that I did a window. Mary was always so nice to work with and she always wanted to keep my window up until after Valentines day. By then they were pretty faded and certainly ready to take down. She actually still has the focal point from one of the windows in her lobby. The year our theme was Christmas Around the World I made a life-size Japanese woman in a Kimono covered with sliced jelly belly candy. She has gotten a bit dusty over the years but for the most part she is still in pretty good shape. Each year we did a window, Mary would give us a gift certificate to her restaurant. And I still had some money left on the last one she gave me. Also one of my fellow puppy raisers has a dog about the same age as Yakira whose name is Osaka. When Karen got Osaka off the truck and thought it would be fun to take our pups to Osaka and have lunch. Well it has almost been a year and we finally got it done. I forgot to take my camera today but I took a couple of shots of Karen and Osaka in front of Osaka with her camera. I’m sure she will share the photo with me then I can post it here. Zodiac was a good boy and resisted playing with Osaka under the table until it was about time to leave. Yakira ended up having to stay home. She has been given no car travel until Monday as part of dealing with her anxiety during the trip to Denver last week. I’ll have to find a photo of the candy windows I did at Osaka and post them here also. Today is another one of those lovely fall days with blue skies and nice temperatures. I think the hardest thing about having a guide dog is probably their retirement. 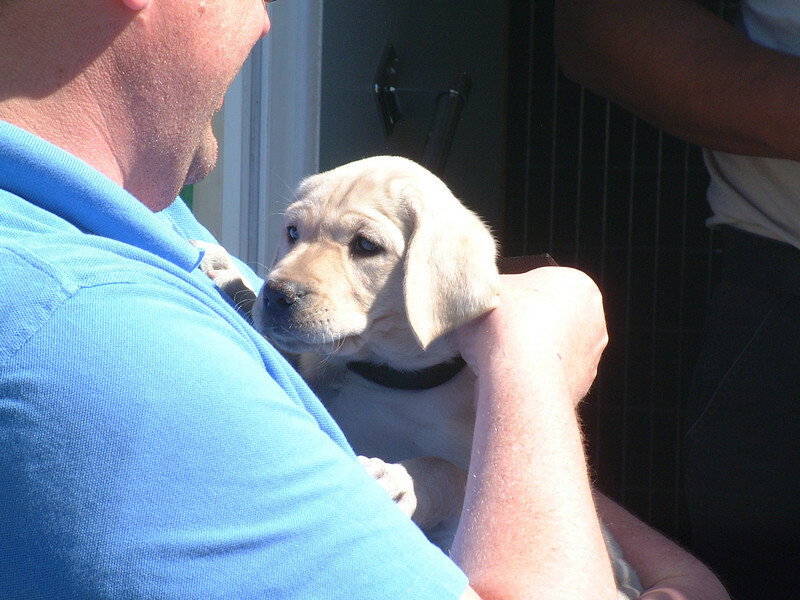 The average guide dog works for about seven years, so most handlers have to go through this process several times in their lives. 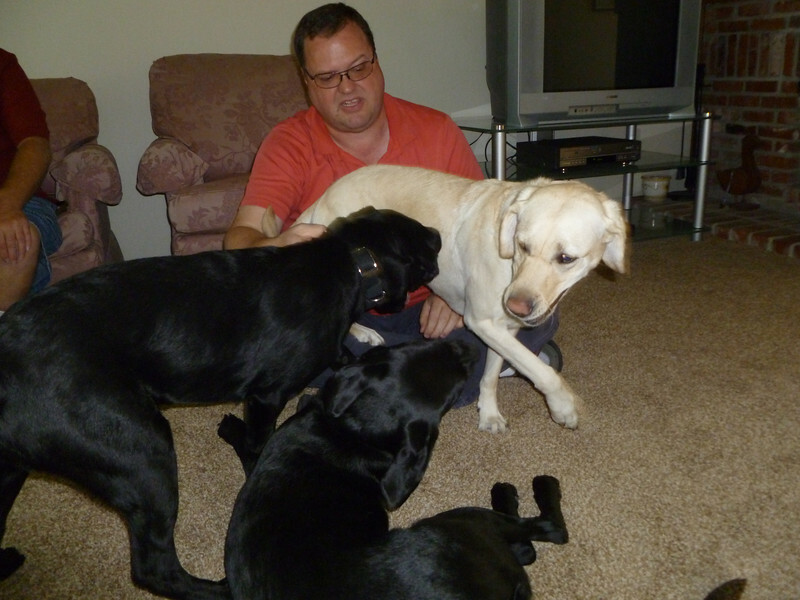 There are three basic reasons that a guide dog retires. The most common is age. Just like with people, dogs eventually get too old to do the work of a guide dog. For most dogs this is about 9 or 10 years old. Another reason for retiring a guide dog is health. Some dog develop health problems that make it difficult or impossible to work. The last reason is some dogs just decide they don’t want guide anymore and are ready for the more relaxed life of being a pet. 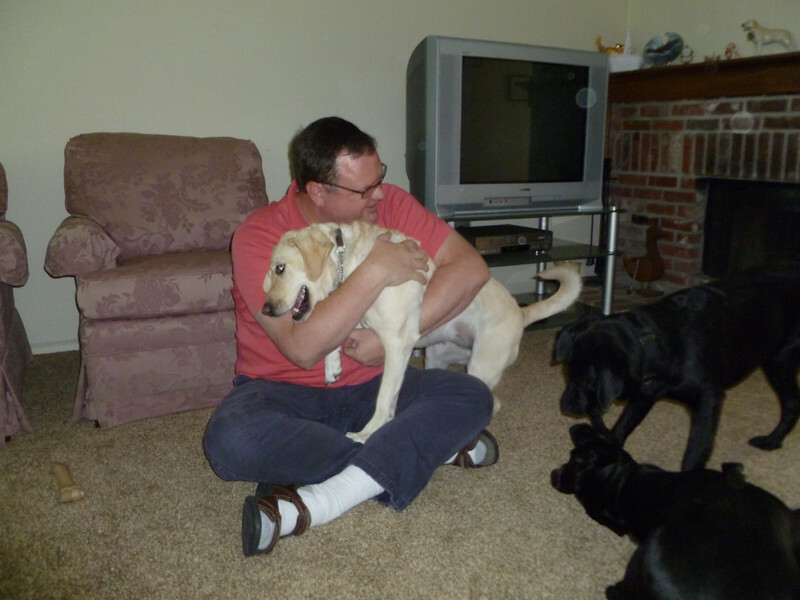 This is sometime brought on by stress or a traumatic incident while working as a guide dog. I encourage you to take some time and read about the impact these amazing dogs have on the lives of those they come in contact with. 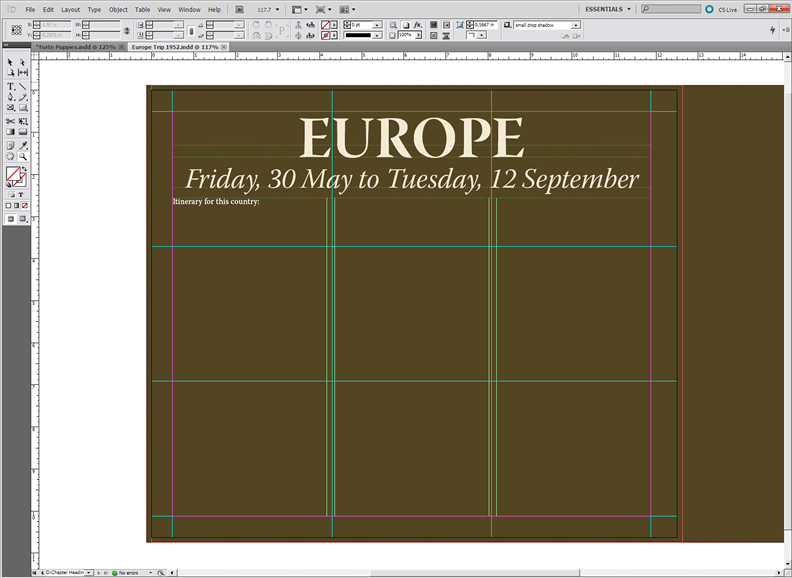 In the early stages of putting together this book, I decided to break it up into chapters for each country. (Germany ended up with two chapters because they re-entered Germany a second time.) So I put together another master page in InDesign to make it easy to have a consistent look for the beginning of each chapter. The beginning of each chapter was a natural place to put the itinerary for each country along with a map showing the route that they traveled. On the map I included the mail stops where they could pick up letters from family and friends back home. I also had information about the money of each country and the exchange rates in 1952. My mom’s passport had lots of entry and exit stamps from her trip so I added those to the beginning of the chapter. I’ll go over how I put the route on the map and how I handled the passport stamps in an upcoming post. Today Zodiac went to the vet to get neutered. It is kind of funny because he was scheduled to do this last week on Monday. But Bill forgot and feed him so we rescheduled for the next day. 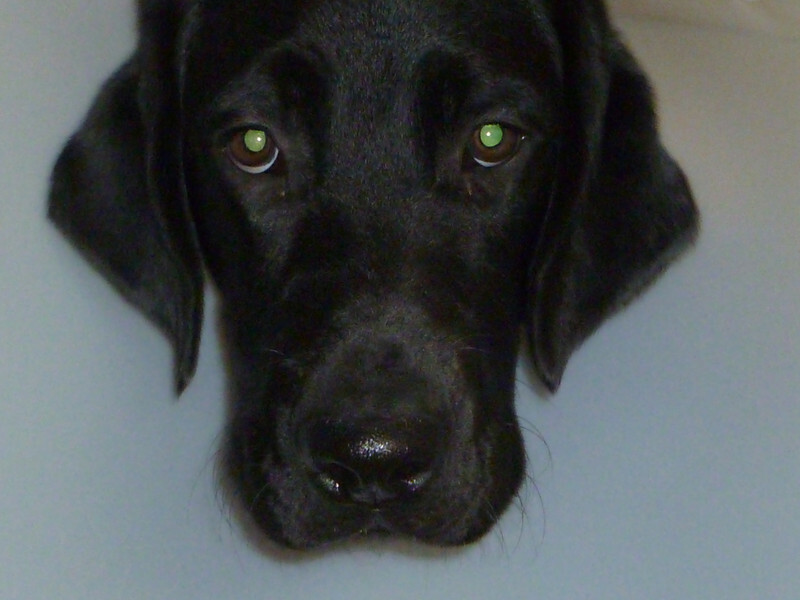 Then when Bill got to the vet, the total came up to much more than the $200 Guide Dogs for the Blind is willing to pay for a neuter. So Zodiac got a second reprieve. Now we needed to find another vet and with the trip to visit Banta coming up on Friday we decided it would best to wait until this week. But today the inevitable finally caught up with him. When I went to pick him up, he was very happy to see me. But walking with the cone of shame on and still recovering from the anesthesia, he had some trouble actually navigating to the car. 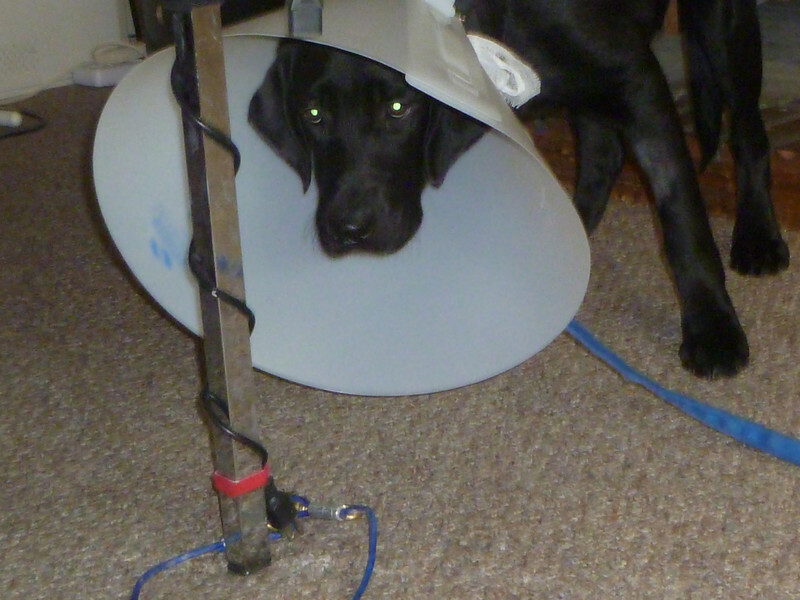 Zodiac isn’t doing so well with the cone. If he runs into something he just stands there and doesn’t try to move. I finally got him to lay down with my help. He is still kind of out of it and started to do pathetic little whines so I took the cone off for a while. But I have to watch him very close because he wants to lick his stitches. Poor little boy. I’m sure he will feel better soon but he has never experienced anything like this before. Yakira doesn’t quiet understand either but she seems to be catching on that he isn’t his normal, “I’m ready to have some fun” self. Started half past 7 o’clock, crossed over sandy bluffs and sandy roads. Stopped for dinner at 12 o’clock, started again, continued over the sandy bluffs until 6 o’clock, when we came to Sandy Bluff Creek, where we camped for the night. Traveled 11 3/4 miles today, and it is, I think, the hardest day we have had on account of deep sand. We had to pull Eliza all through them. Saw Babbitt’s buggy burnt. 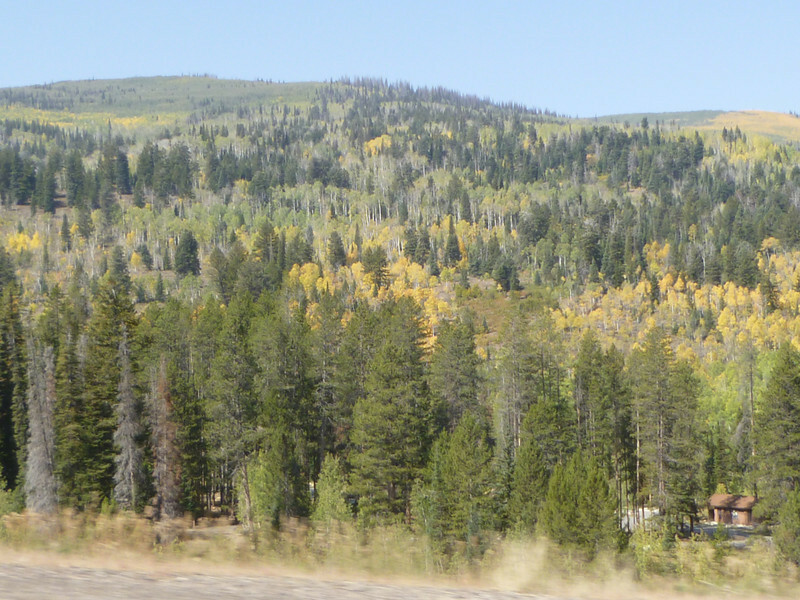 On September 23rd, about six miles east of Bluff Creek, and about seventy yards to the left of the road, a little harness, two wagon wheels and the springs of a burnt carriage or buggy and few other things were seen. These were supposed to be relics of Almon W. Babbitt‘s outfit. The company brought the springs along, but what became of them, I don’t know. Babbitt had left Kearny about the 2nd of September, with Thomas Sutherland and a driver. Two miles further on Captain Hodgett, Moses Cluff and Nathan T. Porter, were busy with a dead buffalo, which they had run our of a herd and killed for the handcart company, having previously killed on for their own wagon company. Some of the handcart people stayed to skin and quarter the buffalo, and bring it along on four handcarts. At night, it was divided among the company. This was the first buffalo beef the company had obtained. Buffalo beef, the lean part of it, is good eating on the plains, but is is courser than ox or cow beef. The next day, September 24th, the company passed the place where it was supposed Thomas Margetts and others were killed by Indians, there being a quantity of feathers strewn about, a blood stained shirt and a child’s skull. The company camped at Duckweek Creek that night and after dark, all the men were called out to form a line aroudn the camp, as it was supposed that Indians were lurking around. About 11 o’clock, the men were called in, a double guard was set for the night and the rest of the men were seriously talked to for half and hour or so, by one of the company who was fond of preaching, on the necessity of vigilance in Indian country. Then the men were dismessed to their tents, except the double guard. Started at 8 o’clock this morning. Stopped for dinner at 12 o’clock, started again. Saw the blood stained garments of Thomas Margetts wife and child, who had been murdered by the Indians. They are committing depredations behind and before. In fact, they made an open attack in day light upon Fort Kearny, on the twenty second of August, the soldiers killed a great number of them, which has stirred them up against the white man, but they keep out of our way. Camped at the Platte. Started at 8 o’clock. Still continued over the sandy bluffs. Saw several Indians on horseback, which are the first that we have seen since the above mentioned. Stopped for dinner at 12 o’clock at the Platte River, started again. The road is rather better, camped near the Platte at 6 o’clock. In the afternoon of the 25th, five Indians, some of them squaws, on ponies, rode past the company and near to it, carefully scrutinizing it, but had nothing to say, and then they rode off towards the Platte. These were the first Cheyenne Indians the company had seen. Started at 8 o’clock, continued until 12 when we stopped for dinner. For several days, we have crossed through a great many creeks and forks of the Platte, which gave us plenty of opportunity to wash our feet. I have the goal to visit the puppies we raise about a year after they graduate. I was so happy last year when things fell into place to be able to visit Apex. So this tripped seemed like another perfect way to celebrate my 50th year. This weekend we got to reach that goal with Banta. Denver isn’t that far away, so going to see her wasn’t to expensive but time this summer was crazy so we decided to wait until the weather cooled and a few of my big time commitments were done. The cool thing about going this weekend was that Sunday marked three years since we first saw Banta as she was handed to Bill off the puppy truck. We had a smooth drive to Denver except we discovered that Yakira is not a good traveler. Zodiac did perfectly, sleeping most of the way but Yakira was anxious the entire way. Other than that the drive was smooth. 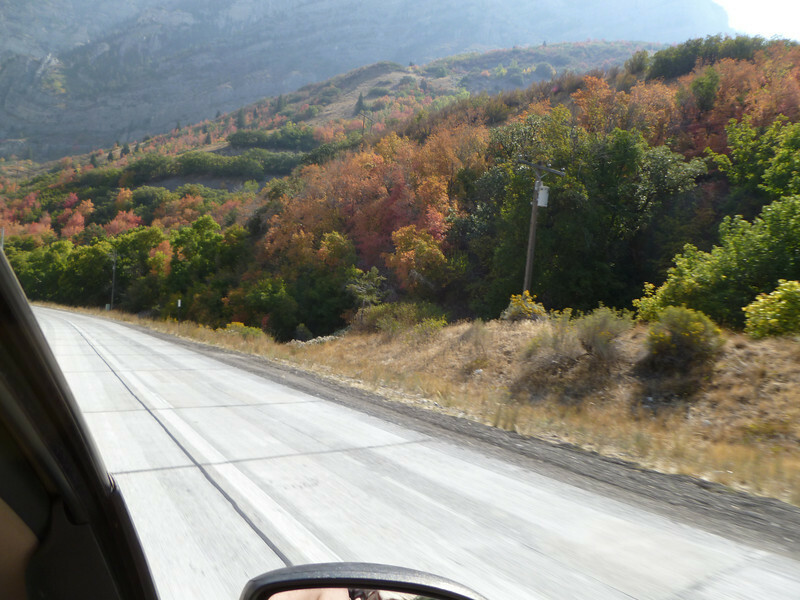 We took US 40 so we could enjoy more of the colors of fall and take a different route than we would take home. We got to see Banta on Saturday. It was so funny, because she recognized the sound of our car. Our GPS lead us to the back of Mark’s place and she jumped up and started to whine. We figured out where to park and walked to the front door. And she was so excited to see us. That was when we found out that she had an early warning system for our arrival. After a brief hello we got the pups from the car and let them get to know each other. 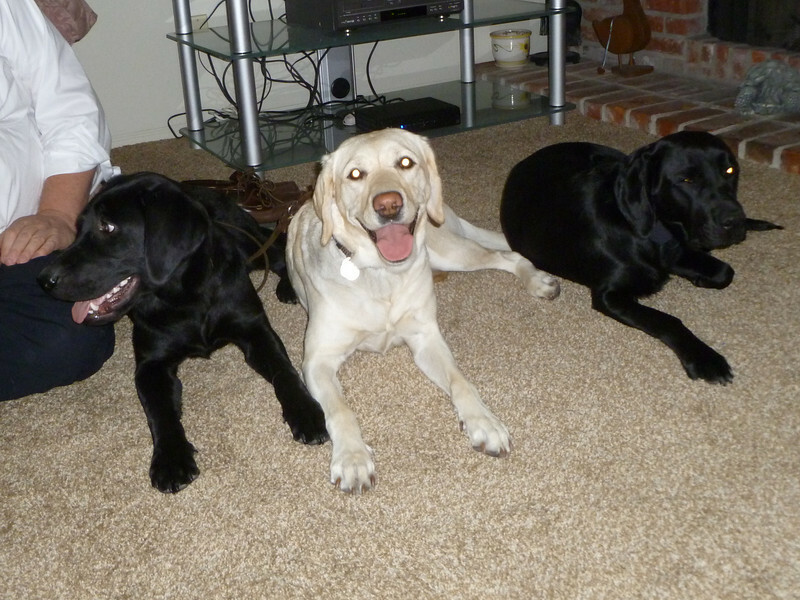 They had lots of fun romping around the house and got along pretty well. 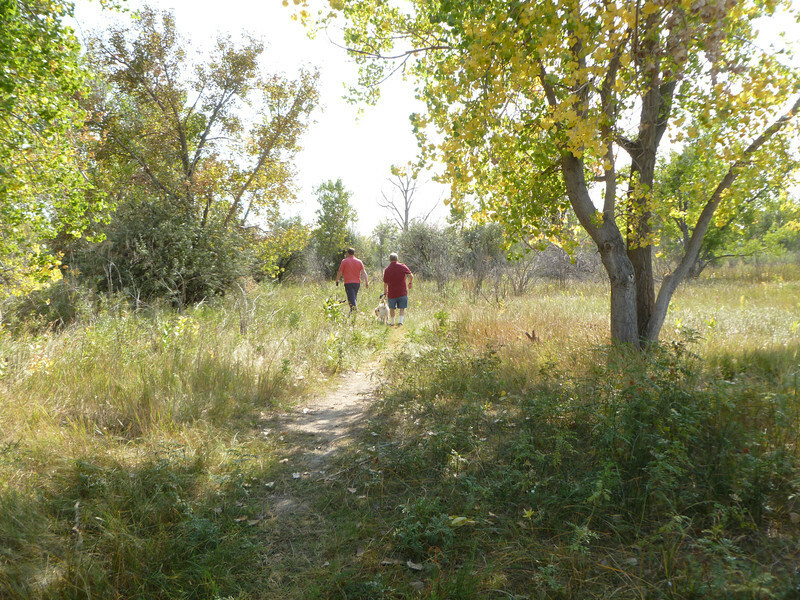 A while later we drove to Cherry Creek State Park and walked along a nature trail to the reservoir. There were so many sailboats on the water, I was amazed. It was an enjoyable walk. Banta and Mark have done a couple of 5k walks this summer but he had surgery on Monday and wasn’t up to too long of a walk but it was fun to just take a leisurely walk and enjoy the nice breeze coming across the lake. The temperature was perfect. We dropped Banta and her handler back at his house so he could rest for a couple of hours before we went to dinner. It was so good to get to know him better. Graduation is such a crazy time that you just done get to know each other that well. That is something that I really enjoyed when we visited Apex last year, and it was the same this time. It is so good to get to see the puppy we raised and see that they are still the same as they were when we had them. A bit more mature and but so much about them is still the same. Sunday we spent a quiet morning sleeping in and then went to church. In the afternoon we went back to hang out with Banta some more and then out to dinner again. Saturday we went to an Italian place called a Mama Roma’s and Sunday we went to Rib City. Both had great food and not so crowded that we had to worry about making room for more customers as we lingered long after finishing eating just chatting about a variety of things. Last night it was especially tough to decided that the meal was over. But we eventually did. It was a nice and relaxing trip and Mark said he hoped we would come back again. The two of them are so perfectly matched. He loves all of Banta’s quirks and has the skills to handle her strong-willed side and even appreciated it. I’m looking forward to seeing Casey next spring either before or after our cruise to Alaska. 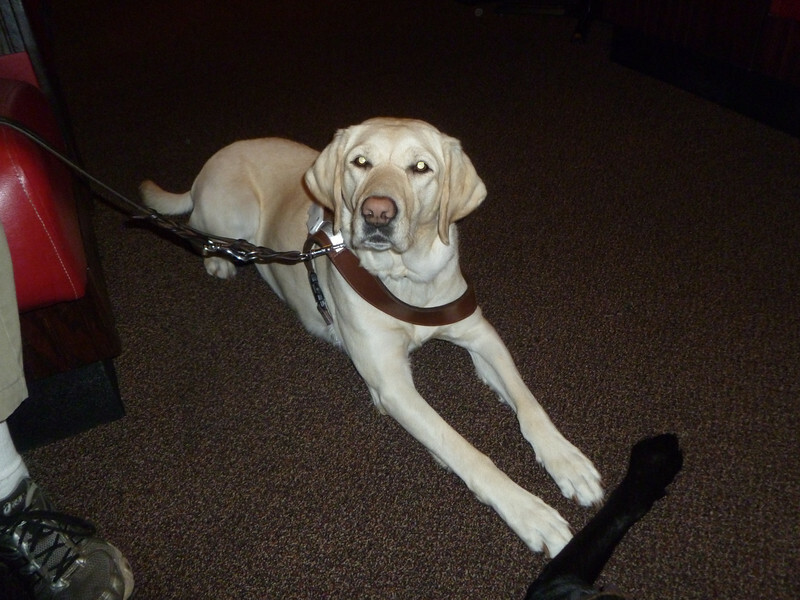 So what is it actually like to live with and use a guide dog? So for this weeks post in honor of National Service Dog Month I’ll try to answer that question. But since I have no personal experience I found a couple of videos produced by Guide Dogs for the Blind that give some ideas of what it is like. I’ve learned so much over the past few years of being a puppy raiser for Guide Dogs for the Blind about what it is like to have a guide dog but I still only have a glimmer of what it is like. Age related Macular Degeneration runs in my family so I could go blind in my old age. 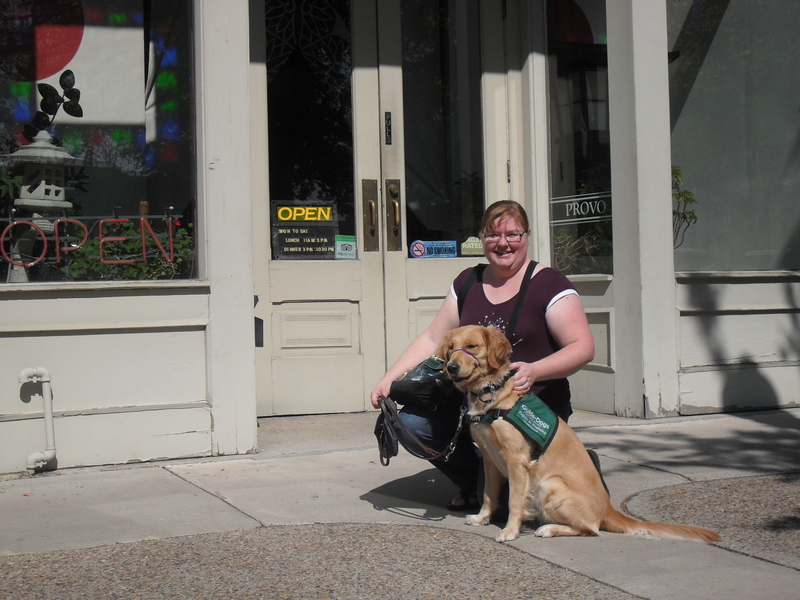 I hope that I will have the courage to learn orientation and mobility skills so that I could have a guide dog. I love the freedom and independence that a guide dog brings to it handler. That is why I’m a puppy raiser. I didn’t know that when I started raising. Then it was about being able to take my dog to places that pets can’t go. I still love that but it is more about being making a difference in the world in a positive way. I still love being able to take these puppies into all kinds of places. I also love getting to know each dog and enjoying their amazing personalities. But the real payback is the impact these dogs have on people’s lives.